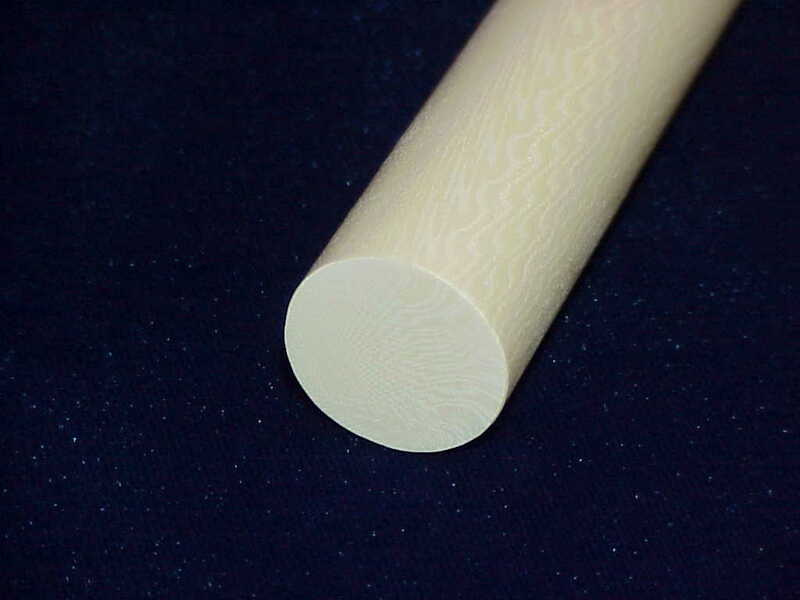 Resin-Ivory™ Top grade Imitation ivory for cue stick ferrules. Resin-Ivory™ is the highest quality imitation ivory we have seen, worked or handled - ever. This material glues well with industry standard glues and has an excellent hit for ferrules and joints. This Resin-Ivory+S™ grade has the Shreger lines in the end grain - hence the +S designation. The Shreger lines are those lines forming the herringbone pattern as seen in the end grain view of real ivory. Resin-Ivory™ has an attractive grain that looks like real ivory. As one turns a cue in one's hand this imitation ivory shows side grain, flat grain and then back to side grain again. This material flouresces under a black light so customs agents will be able to discern it from real ivory without a problem. If you purchase multiple pieces we may send the order in 12 inch pieces if doing so does not drive the shipping charge. This will depend on total order size and destination.